"Zurich is totally sound -- strong in mind and body, good masculinity with loads of attitude and stamina. 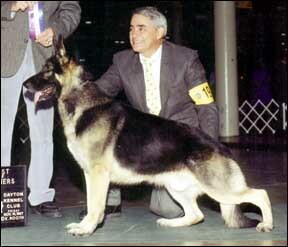 With only a limited amount of breedings, Zurich has proven to be a dominate stud dog. His offspring are attractive and sound with great attitudes. He does have a coat factor. Zurich lives with his champion daughter and his devoted co-owners, the Wesslers. As Martha Stewart would say, "He's a good thing!"